Is Freedom Steel a Steal of a Deal? - TMC Engineering Ltd. Recently while browing social media, the following ad popped up, targeted at Bahamians. 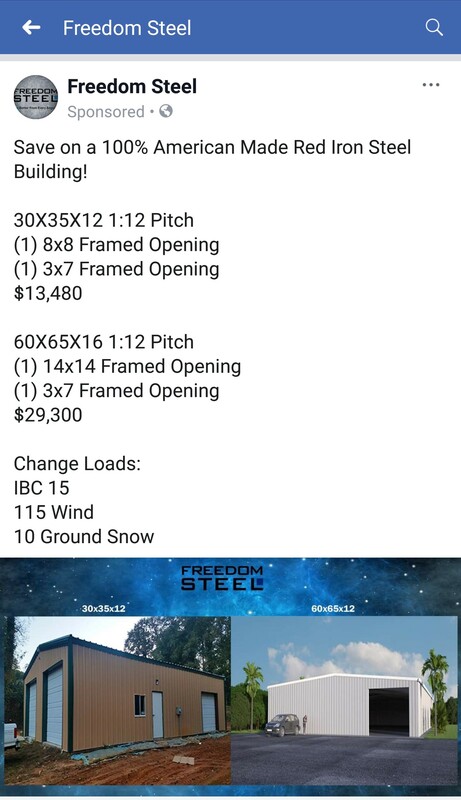 Freedom Steel is advertising pricing on their buildings as the deal of a lifetime! Their building codes are advertised as IBC 2015, 115mph winds, and 10 ground snow load. Most importantly, these codes don’t meet anywhere near the requirements of the Bahamas Building Code. Yes, they can likely design to our higher standards however the cost will increase significantly. While these savings might not seem significant, factor in the additional cost of insurance, shipping, customs duty, and VAT, and those savings get even bigger. Another advantage – TMC Engineering is an award-winning, authorized Star Buildings dealer. We are currently represented on the Star Buildings Presidential Advisory Council and have a strong project history and repeat customers throughout the Bahamas.